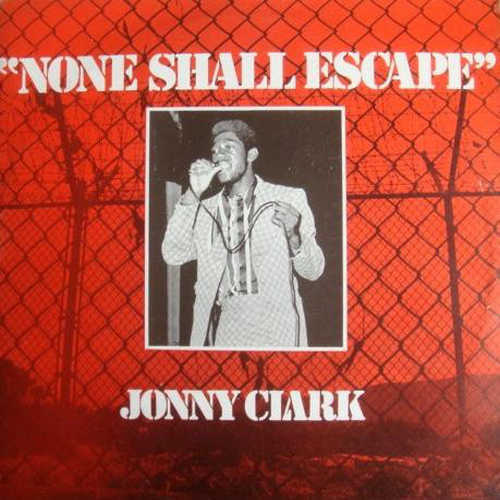 None Shall Escape: Johnny Clarke Interview - Part 1. 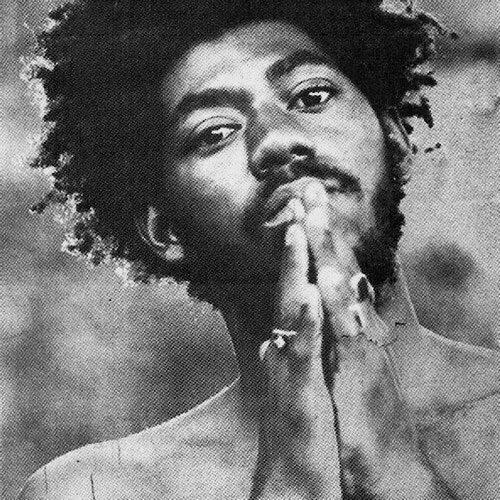 Johnny Clarke performing in Europe & the UK at summer festivals and VP Records releasing the veteran artist’s vintage collection “Creation Rebel” is a good reason to re-publish Peter I’s in depth interview with the one who came close to challenging Bob Marley and Dennis Brown for reggae’s crown. 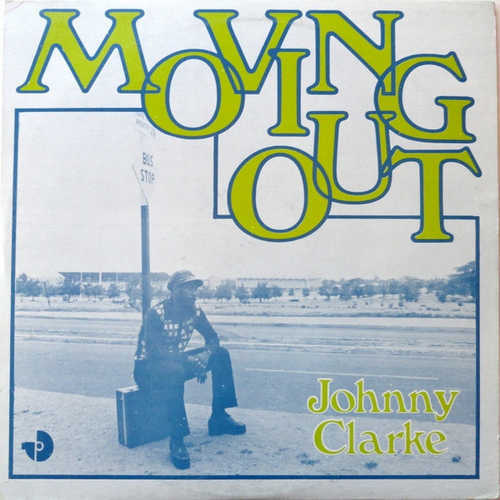 Johnny Clarke is the prototype ‘dancehall’ singer of his day, setting the foundation for future generations to come with versioning, recutting and/or transforming old themes into something new and current. He pioneered this thirty years back but the works still stand as an everlasting monument, or should I say ‘testament’, for an era that seemed to be, in hindsight at least, almost too good to be true. He took Jamaica and the reggae scene worldwide by storm when it needed it the most; presenting a fresh, youthful and energetic style and a crisp voice lots of us would give their right arm for! 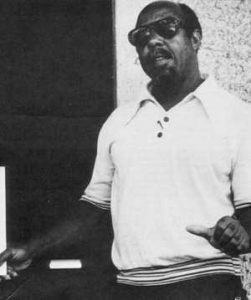 The breakthrough came about in 1974 with the Earl Zero-penned ‘None Shall Escape The Judgement’ which, also, introduced a rhythmic pattern producer Bunny Lee would later run to death, known historically as ‘flying cymbals’; a style emphasized through drummer ‘Santa’ Davis’ Philly-inspired hi-hat playing. A funky, effective and driven style. 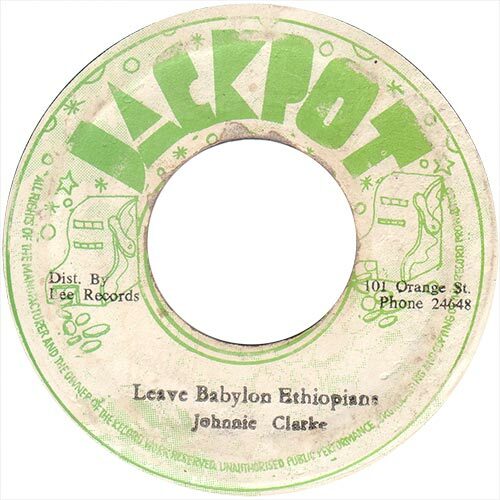 Johnny personified the so called ‘rockers’ period, a transitional time in the music which gave us several classic works such as ‘Joshua’s Word’, ‘Be Upright Natty Dread’, ‘Move Out of Babylon’, ‘Enter Into His Gates With Praise’, ‘Roots Natty Congo’ and ‘Girl I Love You’, coupled with covers of standard songs like ‘Left With A Broken Heart’, ‘Tears On My Pillow’ and ‘Rock With Me Baby’ among others. The man was a veritable (hit) machine between the years 1974 to ’79. 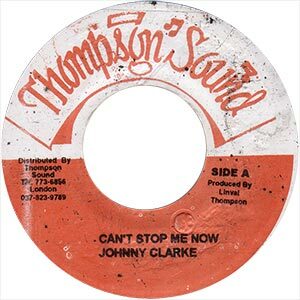 Such a consistent body of work has seldom been seen in Jamaica since then even though, perhaps, he stayed a bit too long with Bunny Lee at the controls, where Lee literally flooded the market with Johnny Clarke records and eventually the winning concept just had to meet its end. Soon thereafter Clarke left the island. 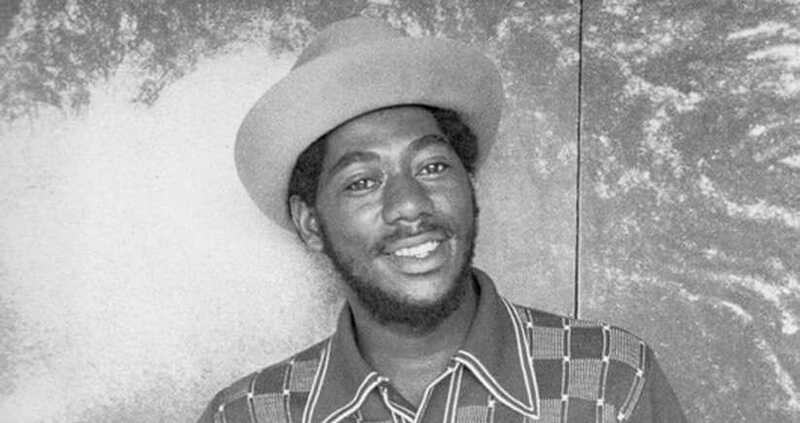 After that he hasn’t done bad in the business, he returned after a few years overseas, mainly in the UK, and cut a couple of solid albums, but has never been able to recapture his position as a strong creative force at the top section of the Jamaican charts since these days despite some exceptional recordings. Nowadays he seems to be focusing on live performances and is, indeed, appreciated all over Europe, Japan and the States. Thanks to Johnny, Nicky for the effort, Big Mikey, Donovan Phillips, and Steve Barrow. You were born in Whitfield Town, Kingston. Yeah, Kingston, that’s Kingston 13. The drummer/singer Eric ‘Fish’ Clarke is your brother, but you never grew up together. No. Well, no, I never grew up with him. No, it’s because – I mean it was a large family, y’know, we don’t grow together. It was like… no small family, I mean my mother and father, like my older brothers, they were, like, stay away in school, stay at a school. You know, was just a school, yeah, more in the boarding school. I think ‘Fish’ grew up in Alpha Boys School, right? Yeah, yeah, it was a… boarding school. Yeah. What was music like in the family, apart from your brother, anyone else who was musically inclined? Your mother and father was able to play whatever or just sang in the local church? Well, my mother was a Christian, a cantor and sang in church. My father now he never really go to church but he just sing around the corner every now and again, y’know, never deal with it on a professional level, just a level like most people who every now and again would be like hummin’ somet’ing. Yes, he never really – I don’t know of him, as I said, doing something international or official, musician or vocalist. So what was Whitfield Town like in those days, any prominent name from the music business residing there in your surroundings? Yeah, you have some names… it’s not really from the golden days, but you have like other people who we consider up (inaudible) like myself who usually work with them more time, do some work in order to get – there was this famous band by the name of The Caribbeats. Yeah, Bobby Aitkens who usually lived like just around the corner, like he was you’d say a neighbour. He was the only recognised singer and entertainer in those days, y’know, it was like the only man. Did you do like an audition for him, I almost get the impression that you sang with his band at one point? If I did an audition? No, well, I never do any audition or sing or anything, I usually go by, right. He had a band, it was the Caribbeats, and Bobby Aitkens led the Caribbeats and we usually is like, we play instruments like the keyboards. Every now and again I come along, go out to a small village in the country where they back different set of entertainers while I was the keyboard player in that band. Oh, so you played with them for a short while. I played with them for a short while. Yes, I did, and then he just audition other players, y’know, from the entire community. I get knowledge that he got to stay in Miami after a while and living there (and now a devout Christian, more or less out of the music business). What was the link between you and Linval Thompson at the time? I know you both grew up together. Well, we’re actually like brethren, not more really than a community brethren, like a ‘corner brethren’. The whole a we sit dung deh ‘pon the corner, y’know, jump in an’ singin’. That’s before music business deh, when man an’ man used to sing every now and again, when we used to feel the vibes. So we always there among the man them an’ him used to come amongst we them time. Was he serious about the music at that time or that came later, when he returned from New York? At that time deh, Linval as you say left for New York and one time him come back an’ jus’ stay amongst we. As far as the music is concerned, he figure say he want to try. At the time we were kinda dominant on the scene an’ he get inspired by that. I recommend him start penetrate the music an’ soon he get the chance through Bunny Lee, things start ‘appen. But he was being ignored as ‘im pass through some producers. What about man like Tony Mack, where does he fit in here? The promoter. Tony Mack? Tony Mack them time have some amateur contest, that’s where we rehearse before we become professional. He was very instrumental to push fe youth in the community, as far as the community was concerned he introduce a lot of talent, like talent shows. How did the first record for Clancy come about, Clancy Eccles (‘God Made The Sea And Sun’)? With Clancy, he was a producer who was more easier to get to, or get through fe really… towards what I wanted to do as far as laying a track or two, one take. You know, I made a direct link and he found out about what I had, good lyrics and so on, and make arrangement for it to be recorded. You know, we considered the time was right for recording. What was the connection to Clancy at the time, you knew someone who knew Clancy, like? That was the link up, or through Tony Mack? No, Clancy was just a producer there downtown. August Town, I remember I come there, him used to operate (from), ‘im worked ‘ard, effective. Him always rehearse the normal way, trying (to) do it with no stress. But for them music I never get no promotion. It didn’t work out there, so you moved on to Rupie Edwards. Well, Rupie Edwards, we’re talkin’ 1973. After I did that song for Clancy Eccles, y’know, him no pay, so I jus’ pass through. I figured more or less I should go to another man, and after some searchin’ I found the Success record shop, that’s where I stop. That’s how Rupie Edwards come about. I do an audition, and he fall in love with two of my songs. Those two sold pretty good in England at that time, did you ever find out how well they did over there? No, no, I know nutten about them songs. I never hear what them sell and so on, but that’s how them used to do it back in the days, just rip you off. He used to travel to England and all them things, came to England and I heard the songs came out there, but as far as how the songs were doing – nutten. I wasn’t informed. I created them, but him never put my name on the record, so I moved on and did ‘None Shall Escape The Judgement’. But that song wasn’t your own, Earl Zero wrote most of it. That was as close to being my own as it could be, like 95, 96, 97 or 98 percent was my part of the song. What about Earl’s part of it? Well, Earl Zero wrote the original song, it was brought to my attention by Earl Zero. It was officially done and officially made by I in terms of… most of the lyrics was already there, but I add my t’ing. You gave your own touch to it. As far as the arrangement, and most of the lyrics also, I did my own t’ing there. What was your impression of Bunny Lee at the time? At the time when I did audition for Bunny him have some of the top acts, name artists, and it was a… just top acts, his stable was very established. So the song for Bunny Lee, it came about as far as the everyday movements, everyday troddin’, everyday huntin’ for a producer. But before hitting with Bunny, didn’t you do some stuff with Niney (‘Warrior’) and Glen Brown too, maybe that came after, some time after this, or in-between? ‘You Really Got A Hold On Me’. Yeah, yeah, you know, but those stuff wasn’t properly managed, so I still have to talk ’bout Bunny. I haffe continue, because Bunny Lee is more really, like, give me the highest motivation and strength and continuation. Oh well, I mean he have me amongst him an’ bring me inna the family now, like a family t’ing, y’know. We meet the Soul Syndicate an’ Robbie (Shakespeare) an’ Santa (Davis) an’ we create an’ create, and we become a link, seen. That’s why we have them other hits deh coming behind ‘None Shall Escape the Judgement’, because we build up a strength and a unification with each other, a togetherness, both with artists and musicians. So when you ‘ave them strength, them vibes deh, it’s like all you going to get (is) more hits, more hits gonna come out, y’know. Yeah, through the unification and the togetherness of all musicians and artists. Sounds like it wasn’t much of a competition as such within Bunny’s stable then, more of a teamwork you mean? Yeah, as I say… Yeh, teamwork, but no competition as far as – there wasn’t really a competition, ca’ nobody was competing. I mean there was other artists there but they were doing their t’ing as well. So, I mean if you gonna compete – you gonna be doing your t’ing, your t’ing have to be up to standard, ’cause these other artists are highly professional artists. He had these other artists among him, whom he usually call upon to fill a gap, or a space. So you’re there, if you don’t come straight to the positive, you can be jus’ there sitting for a long time on the outside watching, watchin’ these other artists doing their thing an’ you on the outside jus’ lookin’ in. You have a sort of ‘expression’ for that in Jamaica, a name you more or less earned after a while, the so-called ‘Studio Idler’, someone who spends a lot of time hangin’ around the studios. Which means you have to sacrifice a lot to even come close to recording, running errands, whatever. Yeah, well, y’know because it’s like – you’re there, I mean you could afford to say that, for them to say it. You allow it, because you know that I was there for a reason while you allow it, because memba; they don’t normally idle around a studio with the people doing that. Because with the musicians (chuckles) and producers does not allow strangers minglin’ around the session. So, if I was allowed to be there it must be special. Mmm, can’t waste no time. Yeah. No, I’m jus’ there waiting for my turn. But there could be no ‘idler’ around the studio, they’ll never allow it. They’d never allow it, anybody there ‘idling’ is also the person involved. So the studios is no place for outsiders. Most people hearing the music, they just hear it and they’re surprised hearing it, because they were allowed to be inside a studio while the song was being laid down, or recorded. But I, as me say I was like always there, seeing the different artists record and seeing the different artists doing their thing. I was allowed to, so if they say I go a studio an’ a ‘Studio Idler’, I’m allowed to be a studio idler. They could’ve dispatched me or run – chased me away from around the facility, but they didn’t. They needed people to be there and observe and to get a vibe, for I must know and break the scene, or the seal. Did it take long for you between singin’ your first songs for Bunny, doing the audition, and finally get to record? Anything really creative, or innovative? Yeah, or they wasn’t even piling on the funds, financially. They wasn’t makin’ the funds turn over, financially. I was on the outskirt, and when I get my time, I mean, dollars start turn. Brought in a lot more than they had had for a long time? There was a ‘dry-up’, so to speak, a big gap. How did that come about again, the process that brought us the ‘flyers’ style at that time? It was Santa that listened closely to the Philly sound, the Sigma drummers like Earl Young, that’s where that ‘flying’ style originated from anyhow, I think. Wasn’t it like that? It was ‘None Shall Escape’ that started it. 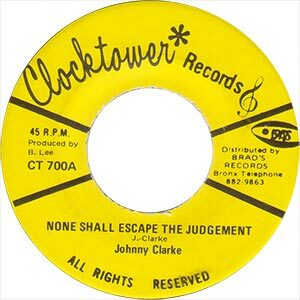 The song ‘None Shall Escape The Judgement’, it was done at Treasure Isle studio, we make that tune down at Duke Reid, Treasure Isle. Duke Reid, Duke is a man whe spiritual, yunno. Yeah, because when that tune deh laid, the man jus’ come upstairs in the evening an’ we see ‘im start dance an’ say to Bunny, “Bwoy, you find somet’ing yunno”. And ‘im draw the gun an’ jus’ fire, bus’ a shot inna the wall, in the concrete, y’know. The concrete deh ‘pon the ground an’ shot fire ‘pon the wall. ‘Cause bwoy, the song deh now, the song really (inaudible) up the Duke, so I know the man spiritual. From what I’ve heard, Duke wasn’t too fond of Rasta lyrics at all. Yeah, well, but ‘memba that song wasn’t his song, that song wasn’t produced by Duke Reid. So I don’t know ’bout that, how that really stay, but it’s possible that you’re right. But it wasn’t, it wasn’t his song, it was produced by a friend of his or colleague deh ‘mongst him inna ‘im stable, and just decide fe do ‘im t’ing now ‘pon Duke Reid’s itself. It was him know Bunny, but Duke know Bunny an’ everyt’ing, but it’s not him song. So maybe if it’s Duke alone, maybe he would’ve accept – possible that he would maybe record it. But it was not him, it was a man who deh ‘mongst ‘im whe try ‘im t’ing. 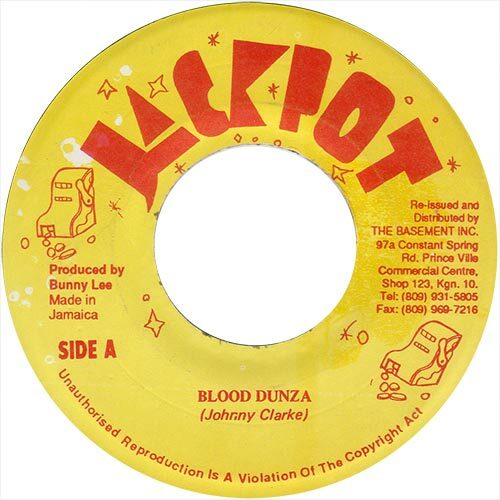 And I know seh, a lot of Duke Reid artists, nuff a the artists them did kinda leave ‘im an’ record for Bunny. Yes, so it’s kind of a ‘link-t’ing’ a gwaan all them time deh. For the dollars to start flow ‘im ought to change the style, and the lickle man deh was there for a purpose, ’cause it come now. And through that now the man deh inna the camp now, because sometime a man, or big people sometimes they alone na go work out what you’re doing whe ‘ave no name. And the lickle man whe neva have no name, the people them now would want a change, and the change mean this new youth and this new sound. And them grab on ‘pon it, and so we run whey. That’s how we come with so much other tune ‘pon the flyers beca’ the people grab onto the sound. So we capitalise ‘pon the vibes of the people them an’ feed them with it, ‘Move Out Of Babylon’ in them days and all ‘Left With A Broken Heart’, ca’ them grab it up or hug it up. We just give it to them an’ feed them soul. Duke was beginning to show signs of his illness at that time, didn’t he? Duke neva sick, man, because man a come, I tell you seh the man deh all a dance an’ feel good, ‘im hear the song, yunno, an’ him dance. Because it wasn’t usually fe ‘im studio, we jus’ rent him studio. So him deh go out inna the area when the t’ing a gwaan same way so ‘im coulda hear it, so ‘im jus’ pass through. Like, it all in ‘im studio an’ him go out deh an’ it was Bunny, him friend, an’ jus’ pass through an’ come up the stairs an’ jus’ a listen wha’ gwaan, y’know. It was his studio and ‘im hear a bad tune, so ‘im hear it and did dance it. He died the year after. Yes, yes, maybe… yeah, I t’ink so. No, maybe not exactly a year but after a while ‘im drop out still, ca’ we come an’ do them t’ing in them time and did really inspire a whole heap a people and set a trend. At that same time, you did a cut on the ‘Ain’t No Sunshine’ rhythm, and the other year Linval released this song. It was called ‘Can’t Stop Me Now’, you remember that one? How that go? ‘Can’t Stop Me Now’? I could play it for you, hold on a second (then spinning this 2003 release on the Thompson Sound imprint, a 7″ which caused quite a bit of excitement upon its sudden and unexpected release. 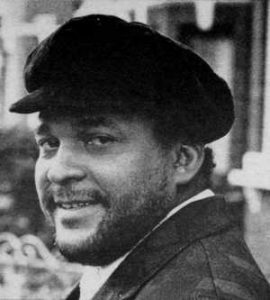 And especially in certain circles when being heard first on a rare soundtape of King Tubby’s Home Town Hi-Fi in session circa ’75, the earliest soundtape discovered so far in 1996). Yeah, that’s not for Linval, that’s Johnny Clarke, man, for King Tubbys. Yeah, so who say ‘Linval Thompson’? Linval himself released this, about two or three years ago. Yeah, you sure Linval do that? If him do that, that’s just a big error. That’s how sometimes that’s a good t’ing – ’cause I have that tune too, and other people know a King Tubbys tune that. We do that for the sound. Right, it was a special, a dubplate in those days. Jacob did a cut on the same rhythm, ‘False Rasta’. I think he did another version for (Augustus) Pablo too. Yeah, I think he done a tune… yeah, I think he done that tune there on it too, ’cause the tune – Horace Andy do one on it too. 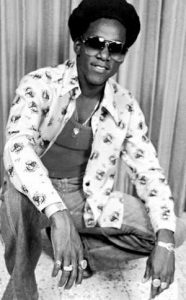 Yes, the ‘official’ recut of (Ken) Boothe’s ‘Ain’t No Sunshine’ (by Bill Withers). Yeah, but Tubbys used to play them tune deh. Wha’ Tubbys usually do now, he usually have you around deh ‘pon a Sunday, every man – jus’ like when we firs’ started, the style whe them ‘ave here now, a do it now, that’s why them a call it ‘dancehall style’ still. But we started it an’ them follow. You see, it’s just a thing, a Tubbys t’ing them a take ‘way still. 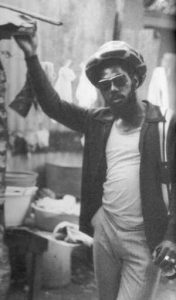 Yeah man, them style whe them ‘ave now inna the music business, right now whe them a do right now, if you follow the history an’ if you wanna know the truth ’bout these t’ings, the real truth me a talk ’bout, jus’ a man seh whe ‘im a seh. Me a talk ’bout the real t’ing, that God know, y’know, is we start it, is Tubbys start it. 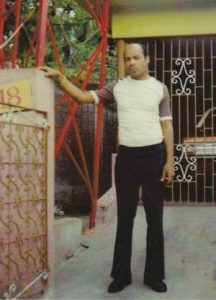 Beca’ it no made fe release, ca’ thru King Tubby’s sound was so classical an’ international to a certain level when Tubbys a play how a sound would, like a clash t’ing, thru Tubbys really ‘ave ‘im studio. He usually ‘ave different artists down there a evening time, before a clash, before all those specials an’ a clash come up, an’ he mek all Horace do a piece. And if you’d notice, you say you hear other people on the same riddim? Yes, Jacob, Horace, I don’t know if there’s more cuts, apart from yours. All right, an’ you hear my own too? Alright, you know them tune deh did long long before them dancehall t’ing you ‘ave gwaan, you jus’ see after a while the same trend the dancehall come tek when more than one artist go ‘pon the same riddim. You notice it? And then now, them mek it more commercial an’ put it ‘pon record an’ radio station, them t’ing deh was jus’ fe sound purpose. Yeah, and we first start do it, yeah ’round a the sound, fe clash. When him play all that now, went out with the sound, yeah him jus’ draw the next Johnny Clarke dub ‘pon the riddim too, and ‘im draw maybe a Cornell Campbell, an’ him draw all a Jacob, an’ him draw a Horace, whe we woulda say ‘Sleepy’. And a so, and the sound dead! Ca’ the next soundman cyaan do that. So when we use’ to kill sound now, them woulda use it now – them all is a follow t’ing, yunno. And them turn it out now and call it ‘dancehall’, that is our t’ing. What did you name it back in those days? Is dancehall same way, beca’ them fe dance… That’s why them call (it) dancehall, beca’ them tune deh was made fe dancehall purpose only. And if you know is only dubplate them tune deh was on, never fe release. The lyrics in that song goes like ‘Nobody can’t stop me now, nobody want me to go on, all them do is fuss and fight…’. But the lyrics, it sort of implies that you got a fight from your family at this time, they didn’t exactly ‘approve’ you to go into the music business, did they? A proper job instead of the uncertain income or instability from being involved in the music, so they put you down. In other words ‘You ought to stay on the safer side of things, to get an education and stay away from such foolishness as recording’. Yeah, that too. And I remember we inna the community, through people whe we remember – music inna them time deh, recording was highly respected. You know, we never had… record never drop so low though. I mean, almost all a the recording artists them live around me still. But it did come like some artists outta space same way, as much as them come right from same place a Jamaica an’ live there too, but (we) usually see them as like Gods, with the artists of them times. You know, in a the early times, from ska to rock steady. So when you as a youth inna the community a man see you a go be a singer an’ you haffe become an artis’, people a wonder if that is real. Them no see you deh so, ca’ them cyaan see you be like that! So the way it a turn out da way now it was jus’ pure surprise an’ people… Yeah, because the music t’ing was highly respected, from the people. The same people them who live ‘mongst we. ‘Cause normally, I mean being an entertainer inna them days deh, people don’t normally see them. Because as I say, these tune deh is not for the outside people, is for a set of entertainer who goes to the Studio One fe work, or a Dynamics or a Prince Buster, or inna Federal or in anyone of them big studio deh. Like whe you hear seh you couldn’t go in the studio fe go see them, or you go see them ‘pon a stage show. Them entertainers deh come almost like them a foreigners or outer space, and yet still them was right there with me inna Jamaica deh. But them was so highly respected, because record was really somet’ing special inna them time deh. When you hear a man, a singer an’ you hear seh it deh ‘pon a record, for a man tell you seh him a go be ‘pon a record, sometimes you find artists no believe… Because, you can’t believe that a man go right beside you go do a record, because most a them artists deh who you know you see ‘pon a LP an’ a hear on record, it’s like them so near and yet so far, so far and yet so near. Ca’ you ‘ave them way out. Yeah. ‘Cause singin’ was like – especially the artists them that come before I and I, we used to look up to them. Like, some great people, kings and queens. And some people were like gold, like you wonder if you can even touch them, ca’ them is somet’ing whe nobody can hol’ or touch. Me a tell you, we never water dung music, the artists them so simple inna them time, man, the artists is simpler ya now, yunno. Yeah man. So when a man find out seh, y’know, sometime you haffe tek it be a secret inna you community until a man jus’ surprised an’ hear you. Ca’ if you even tell a man seh you waan fe become a singer, you hear a man might jus’ have you as a joke, or it no real. When a man hear you a sing, a man jus’ feel seh it jus’ a corner t’ing when him go hear you ‘pon a record, beca’ them don’t t’ink it’s all that easy. People inna them time deh didn’t think to become a singer was that easy, them t’ink was like one of the ‘aaardest t’ing fe do, you understan’. It was more easier fe a man go look a work, have to become like a workin’ man more than to become a singer. Just because it was so ‘special’ in the minds of the public? Just special, you know. Yeah. I mean, as I say they was very much cherished, yeah, jus’ golden people. Right, so your family did fight you down a bit, before you showed some success with it. Beca’ you see, as I say the music business was kinda isolated from the outside ordinary people, was like a secret going on inside that studio. The people jus’ get a chance fe just to have the song come out on a record, or they play it on the radio. But they never know how it was being put together. They never know that it was from a tape, and is from a tape you go to a mixdown to a smaller tape, then you prepare it to be mastered. And then it haffe become a stamper, and then you’d get the stamper and you’d prepare have the record being pressed, and then now released. But most of the majority, the ordinary people don’t know ’bout that, is just the people who been involved in the music to ‘ave that kinda knowledge. So for a people, thru nobody na go really push them; if a man lock ‘im door ‘pon you, an’ them na really waan let you in fe see wha’ gwaan deh now, you na go force your way in. You jus’ know seh, bwoy, it’s jus’ like, them say ‘Beware of Bad Dogs’ so you jus’ walk an’ hold your head straight, beca’ bad dogs over deh so yunno. So you no waan no dog come eat a bone or eat whatever him a do ’cause, bwoy, all you a do you know seh you no haffe go deh. So you gwaan whe you a go, go about your business yunno. So, the kids them always – that was private, so a lotta people… But everybody know seh the people know you haffe go a school. Did you have any other ambition before the music took hold of you? Yeah man, me usually go a JC an’, like, me always usually work in Grace Kennedy too. Yeah, out a school me usually go work at Grace Kennedy all dung a Harbour Street deh. What was the work in there? At the time, like ’70 or ’72 running off, before music t’ing, was after school before we went in the music t’ing. Like a billing clerk, working inna the office down deh. Right, taking care of paper work. Yeah, yeah, because it’s like normally through the general manager or the owner, Grace Kennedy have a big link with the school, yunno. 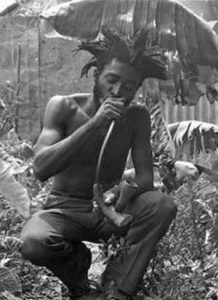 You have place where most a the youth them whe leave school tend fe hang around on the streets, or jus’ you waan know seh, well, a that was a good t’ing fe keep youths… that’s why them time wasn’t so hard, because youth used to ‘ave more discipline. Because they used to secure somet’ing fe the youth after ‘im leave school, it occupy ‘im time. Them never gonna idle, or when going to school them go siddung ‘pon the corner an’ a loaf, y’know wha’ I a seh? Him lef’ school, get all a certificate an’ go straight to Grace Kennedy with that, an’ from the boss say you come from certain school or know whe maybe ‘im get certain information, right away you’re enrolled in a job. So it’s like an exchange from school in a work yunno, you ‘ave no time fe hang aroun’. A man na go a school or you done with school, but you’re jus’ by yourself so, ca’ you a workin’ man now yunno. You see me? So t’ings coulda did gwaan flow. Meanwhile, when that a gwaan still me know seh a music t’ing now we waan deal with still, all wha’ gwaan. Ca’ right now a close to downtown deh an’ the music t’ing ya a downtown, so everyt’ing deh right downtown. How did you find working down in Waterhouse? I understand you loved Tubby’s studio to begin with. Yeah man, beca’ highly motivated vibes yunno, ca’ Tubbys usually have we deh ya. Ca’ thru we usually love go to dance them too, an’ like if Tubbys a clash with all a sound all ’bout, country or all ’bout. An’ thru we know whe Tubbys a plan, ca’ like sometime him a plan. Ca’ him ‘ave them t’ings fe sound, so him can ‘andle the sound fe the night to come. So him jus’ deh-deh an’ all a the artis’ them used to go deh. The artis’ an’ the crowd used to love Tubbys, an’ the way ‘im waan we do fe go mash up the sound yunno. And through we know wha’ gwaan sometime we all go a the dance too an’ deh-deh too fe see the whole crowd, ca’ we know wha’ go ‘appening now yunno. He had U Roy, I Roy and U Brown on and off on the set during the seventies, but did he let you sing live on the sound at the time? No, Tubbys never used to do that, Tubbys never used to do that. The first known ol’ sound whe do that is a sound named Black Harmony, a the firs’ sound start do them t’ing deh too, Black Harmony sound. With Jah Stitch on the mic. Yeah, yeah, fe real. The first sound, but ‘im never do it – him only used to do it in the community, like all a the community named Greenwich Town. Them usually down deh, it did rest down deh, down deh was them base. So them down deh more time, an’ a night time them run a lickle community dancehall. We all (inaudible) like any other artists more time, and used to take all the mic an’ sing one or two tune, one an’ one ‘pon the corner an’ man jus’ feel nice, really nice up the place! Ca’ we deh-deh an’ bu’n up the chalice an’ we as the artists inna the dance an’ jus’ take the mic, an’ jus’ nice up the place deh an’ man feel good. Yeah, jus’ feel good yunno. How much was Tubbys participating in the songwriting process, because you wrote several tunes on the spot, at the studio. How was the input there in your work when recording for Bunny? Tubbys is a man who is a great mixer, y’know, an’ put the spice inna it an’ mix it an’ echo it up an’ play a wicked dubwise, version mix an’ all them t’ing deh. Ca’ you don’t know seh all a them t’ing a go with the same spice. Beca’ after a while the people them get interested fe buy the tune them whe a get, get a certain type of beat. Ca’ we say we usually ‘ave a lickle young sound too, all a them coulda jus’ play 45. At the same time ‘pon the 45 them want it out of the ordinary, jus’ a raw version t’ing. They want it with them mix ya now, echo t’ing inna it, it wicked an’ it sound good too yunno. So when Tubbys did mix we an’ have it ‘pon all a 45 now, you’re on the A-side an’ it ‘pon the flip you a get them t’ing deh. Soundman, the club an’ all them t’ing deh a buy that record, beca’ them is deh ‘pon them t’ings yunno. So it kinda create a input whe it’s towards we an’ the sound, an’ the man could afford fe buy jus’ the record. Him never reach the dubplate still, but ‘im waan the dubplate kinda vibe. An’ is a man whe coulda mix a 45 like a dubplate t’ing, delay an’ echo, an’ every sound or soundman want them t’ing deh. Seh well then, like how it is usually them ‘ave the B-side, is when you turn over an’ play the real tune or the number one tune or them cream of the crop song, when you’d turn it over then you hear a next tune. Like how you say ‘version’ or ‘dub’, Tubbys change that now an’ mek the B-side be more exciting, more as I say ‘interesting’. Man na play the tune done an’ it no flip it over. Ca’ years ago man used to play a tune an’ when ‘im done play the tune, jus’ change a next, put on a next record an’ no t’ink ’bout the flip yunno. But after a while, no way ‘im a go tek off the A-side an’ don’t flip it over, to the B yunno. 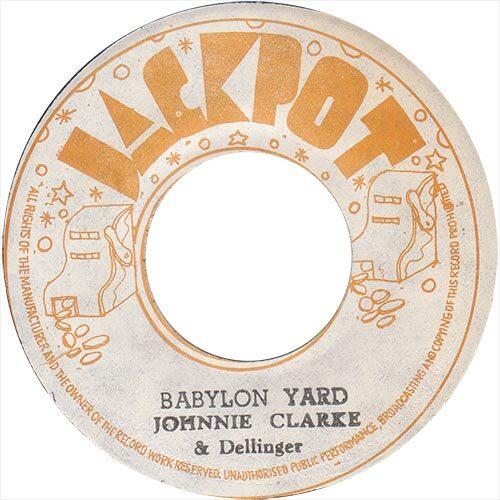 Ca’ then again, version is just – when the deejay them a come in like all a Jah Youth (Big Youth) an’ U Roy an’ all a certain man now come inna the business now, after you hear the raw singin’ now you goin’ hear all the deejay ‘pon it a gwaan with them t’ing too. All that did generate some more interest too as far as the B-side, the flip, is concerned. And man waan hear the deejay in competition with the singer now, the same tune whe the deejay a do fe ‘im t’ing. If a find a deejay t’ing a gwaan deh now still, you see whe me a seh? Yes, so is a whole heap a t’ing ’bout it. He is there now so every t’ing you a hear me a tell you now, if you go search it out you a go find it or read an’ see it same way so. A so it go yunno. What about the writing process. You wrote with much input from Bunny, or did you and Linval collaborate on a lot of those songs? Yeah man, sometime, beca’ as I tell you seh is a togetherness t’ing. Ca’ more time me a come with my tune an’ if my tune nice an’ t’ing, is jus’ timing. Bunny is a man now whe him jus’ go mek all a riddim, yeh the music deh we call a ‘riddim’. An’ sometime ‘im ’round deh an’ put the tune together an’ is a man whe all deh-deh too with we, an’ put in two punch with we an’ t’ing, an’ all man like Tappa Zukie an’ all them man deh too a deh-deh, an’ Dillinger too yunno. So, bwai, you see ‘im put in this too, an’ that’s thru man an’ man a deh-deh yunno. An’ everybody a hear, every man a know when we go over the tune, it mek people jump up. 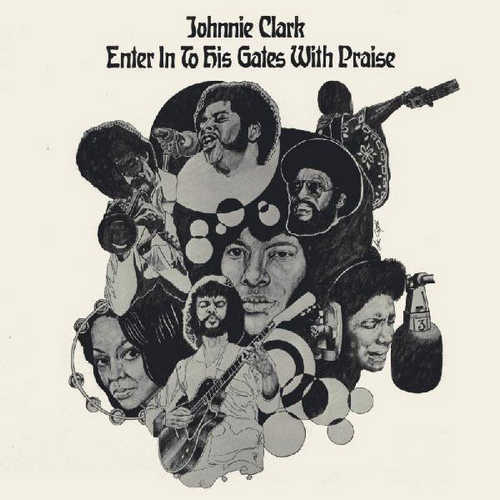 Johnny Clarke - Ain't No Sunshine + Version (CLOCKTOWER) 12"